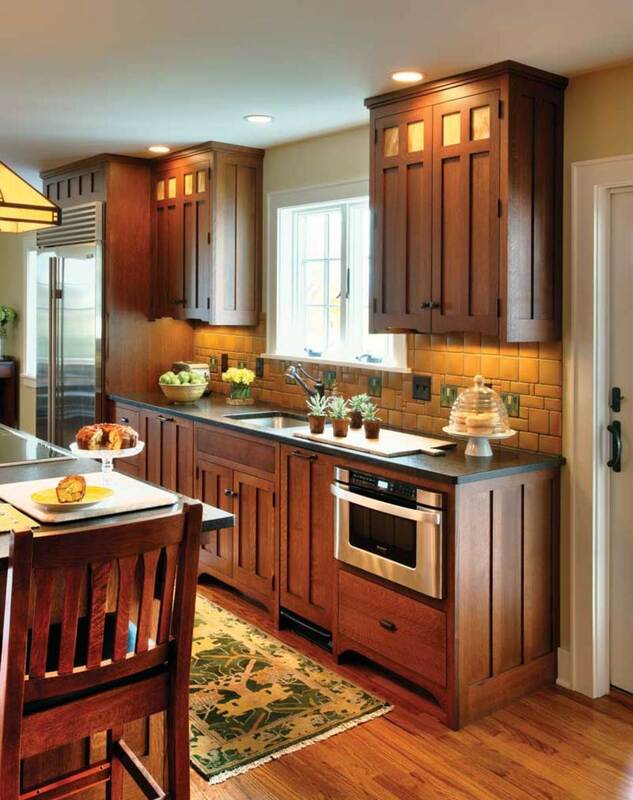 This new kitchen in the Craftsman style was inspired by Stickley furniture: Handcrafted cabinets are made of quarter-sawn white oak with a ‘Copper Brown’ finish that Crown Point developed to match Stickley’s ‘Onondaga’ furniture finish. The Connecticut house belongs to Jon and Cynara Kornacki. Jon is a serious collector and scholar of Fulper Pottery, which operated from Flemington, New Jersey, and produced “art pottery” between 1909 and 1934. 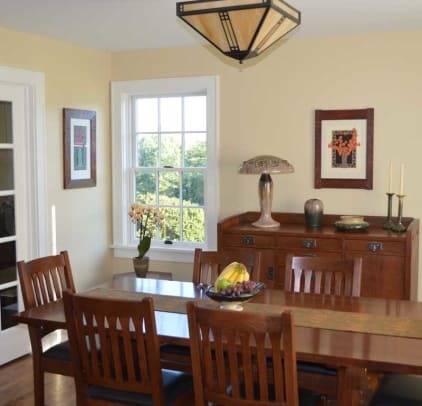 The couple have been refurnishing the Colonial-style house with Arts & Crafts pieces; the kitchen renovation was the most significant project in the transition. The new kitchen (now rid of pale cabinets and blue Formica) occupies the space of the old kitchen and dining room. An end cabinet has lighted display space for special pieces of Fulper pottery. 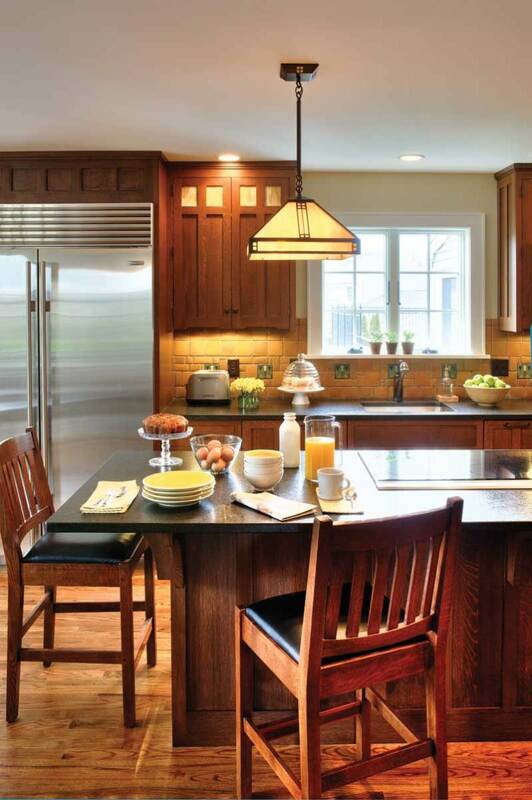 Jon Kornacki designed much of the room himself, keeping in mind his wife’s requirements: double ovens, spice drawers, a large island with seating, and a lot of storage capacity. 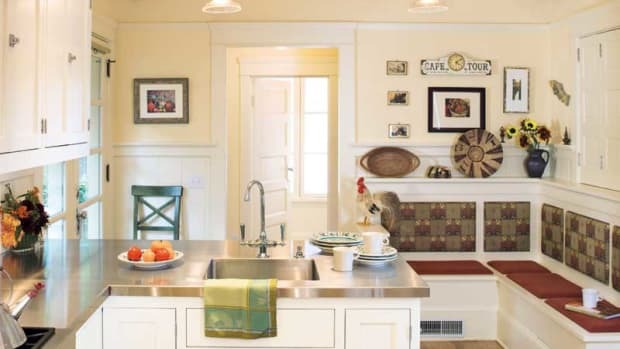 Final layout and certain details came from a collaboration with Jeff Schneider, a designer at Crown Point Cabinetry, whom he’d met at the Grove Park Inn Arts & Crafts Conference in Asheville. 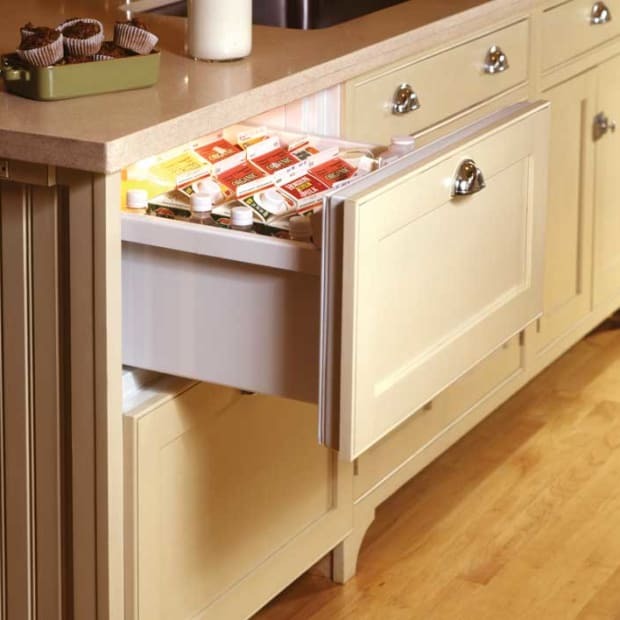 Stainless steel appliances are built into cabinet runs. 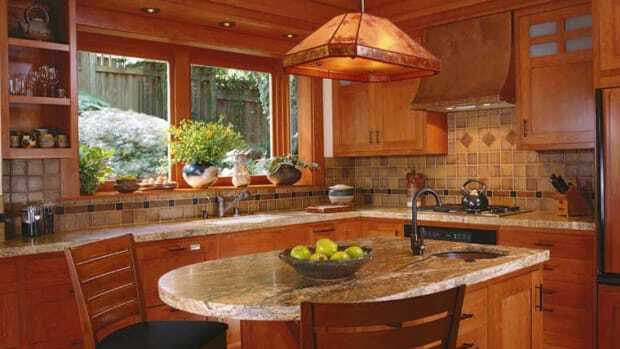 The island is treated as a furniture piece, its cooktop barely noticeable when not in use. 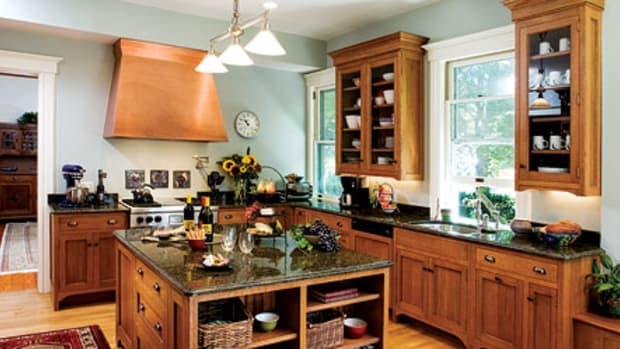 “My wife and I quickly agreed on Black Pearl granite with a leathered finish, which has a texture reminiscent of Arts & Crafts metalwork,” Kornacki says. 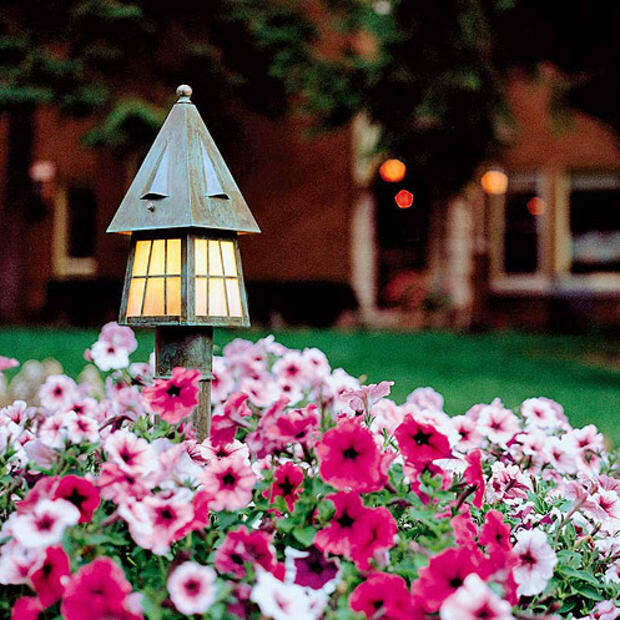 “It feels wonderful!” Combining reproduction fixtures with modern lighting is consistent with the design approach. 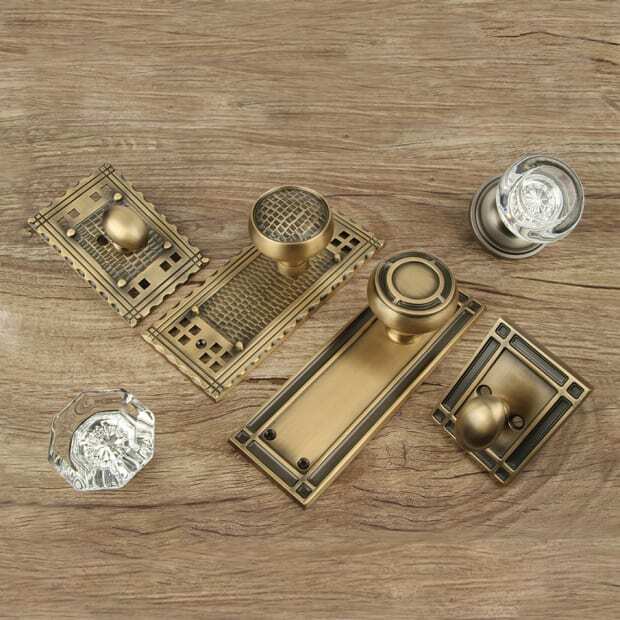 Arroyo Craftsman’s ‘Prairie’ fixtures’ motif of squares and rectangles echoes cabinet details. 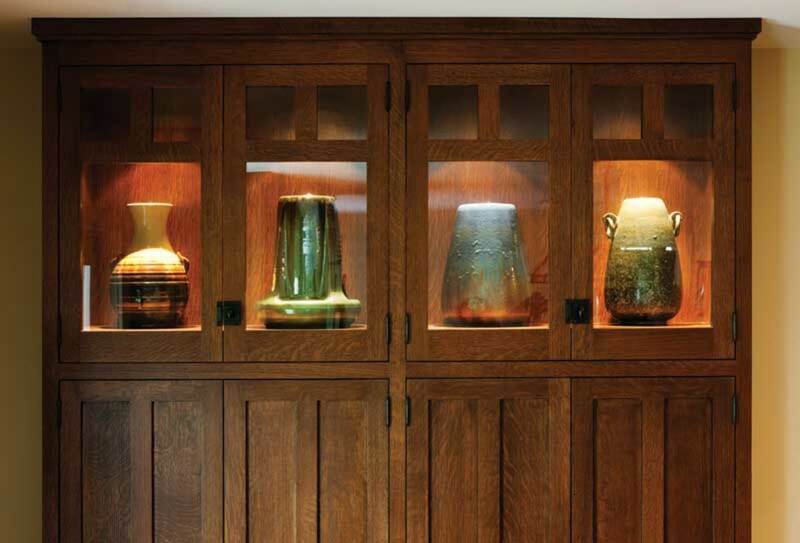 A tall cabinet was custom designed to accommodate the homeowner’s prized collection of Fulper pots, which are illuminated from above. Glass in this cabinet is clear; other cabinets feature ‘Wispy Brown’ art glass. 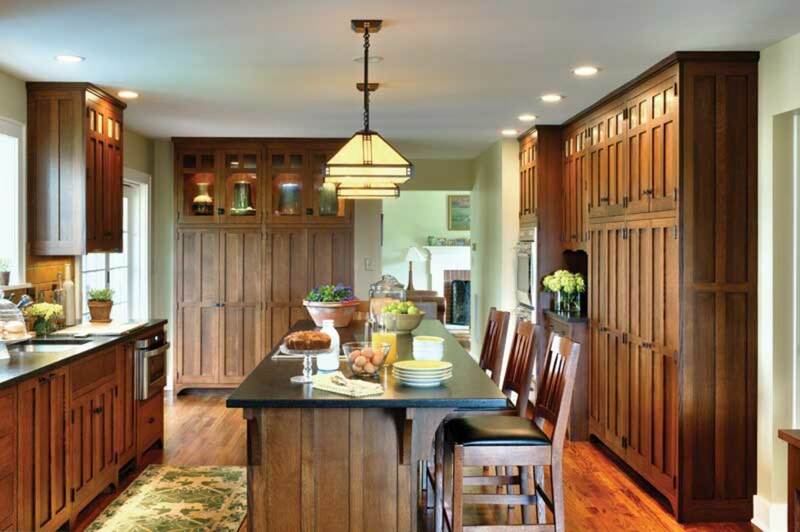 On the wall opposite the sink, a long bank of cabinets creates a pantry. The addition of art tile in warm Arts & Crafts colors furthers the sense of a furnished room—this kitchen is more hearth than lab. Kornacki had encountered Motawi Tileworks, too, at the Asheville conference and was smitten with their rich matte glazes. Motawi designer Hadley Lord suggested the mosaic pattern of field tiles in random sizes. Homeowner Jon Kornacki and his brother David created the Fulper appreciation website fulper.net. Since David introduced him to the work of the Arts & Crafts movement in 1994, “I’ve been both a student and a collector,” Jon says. “My focus is on Fulper pottery, but I also have original L. & J.G. 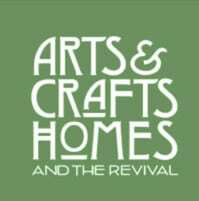 Stickley furniture, and a special interest in Arts & Crafts architecture.” Jon has published scholarly articles in the Journal of the American Art Pottery Association [aapa.info] and is writing a book about the Vasekraft lamps. The well-furnished room has a period palette and plenty of storage.